The word "Havasupai" means people of the blue-green water. From my viewpoint 1,000 feet above the parched desert canyon, the thought of turquoise water seems downright whimsical. I shoulder my pack and trudge into a landscape as welcoming as a blast furnace. This is a land of rock, matched in hardness only by the glaring mid-day sun. Yucca, prickly pear and cat claw acacia wait patiently to scar bare legs and snag unwary hands. Over the sweltering horizon, the Grand Canyon cuts a mile-deep gorge to the rocky heart of the desert. If my destination, Havasu Falls, a tributary of the Colorado River, is the Garden of Eden that calendar photos depict, I'm going to have to hike through 10 miles of hell to get there. I descend the cliff through colorful strata of rock and time. White to yellow, buff to brown, and finally plunging into red. Talus slopes fan out beneath each tinted limestone and sandstone layer. Blackbrush dot the gravely slopes like freckles on a kid's sunburned face. The path to the village of Supai and the three waterfalls on Havasu Creek begins at Hualapai Hilltop, a cliff-side parking lot at the dead end of Arizona Highway 18. The Havasupai were farming the moist valleys of the desert tributaries to the Colorado River four centuries before contact by Spanish explorers. In the 1880s, miners and ranchers invaded their homeland and forced them onto a 500-acre reservation. Finally in 1975, Congress enlarged their reservation to 38,000 acres. Today about 208 Havasupai live in Supai. They survive by using traditional subsistence farming methods -- and by collecting tourist dollars from visitors who come to see their "blue-green waters." The hilltop parking lot had been almost full when I arrived late the previous afternoon. German and British accents mixed with a collage of American dialects as we watched the sun drop behind the mesa. Like myself, the other hikers camped in the parking lot so they could get an early start and reach the falls before the summer sun turned the canyon into an inferno. Those who wanted the comfort of a bed stayed in the Grand Canyon Caverns Inn, some 60 miles away. The trail switchbacks down the cliff face through the Coconino sandstone caprock. The ancient winds so cross-layered the sand dunes that they resemble a disorderly stack of pancakes. The Havasupai Indians call the mesa the White Cliff and traverse it daily with trains of pack horses, their only means of access to the outside world except by helicopter. The knife edge of erosion has shaved a chasm into the desert floor revealing 350 million years of the earth's history. Like a movie running in reverse, the steep trail into the canyon drops backwards in time past the rise and fall of great mountain ranges, the appearance and extinction of lush ecosystems, and the rolling surf of countless seas. Each thin strata represents a geological event too immense for human minds to comprehend. The inner gorge of the Grand Canyon, the final destination of Havasu Creek, exposes the remains of a two-billion-year-old mountain range once as tall as the Himalayas. Wind and rain wore it flat. Uplifts created another mountain range in its place. Once again, relentless erosion reduced it to a flat plane. Then ocean waves lapped at the shores for another eon and deposited 3,000 feet of sediments. The strata beside the desert trail entomb the bodies of billions of microscopic sea creatures. With a history that predates the advent of life, this land wedges itself into human perception like a rock in a boot. It forces minds to contemplate the significance of the blink of time we call human history, and the accomplishments by which our race so proudly judges its worth. Horizon to horizon vistas stretch beyond the mesa tops and into the abyss of the sky. The expanse of space simultaneously dwarfs my concept of self and reinforces my identity as a unique individual. 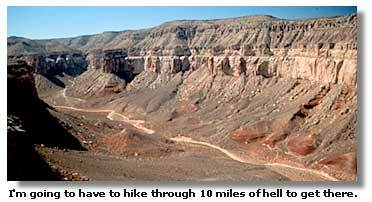 The ten-mile hike challenges my will to endure hardships for the reward promised at the end of the trail. And an Indian community in existence for 700 years reinforces my feeling of being a visitor in this vast country. In the distance I see a row of dots on the trial: a horse train winding toward the trailhead to pick up supplies and mail. 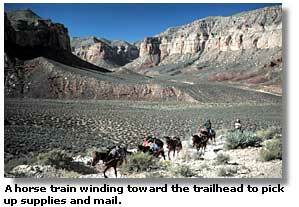 Supai has the only U.S. Post Office dependent on horseback mail delivery. I remember the UPS commercials and wonder if they deliver to Supai. More importantly, the thought occurs, do they deliver with backpacks? Once on the broad gravel terrace at the foot of the cliff, the trail levels out and follows the gradual descent of the dry creek bed through Hualapai Canyon. I pass the approaching pack train, several children on horseback and a group of tourists who chose to ride rather than walk. Another pack train passes heading toward Supai loaded with soft drinks and canned goods. By now the thought of a cold soda sounds as appealing as the crystal pools beneath the waterfalls. Gradually the drainage narrows until rock walls that seldom see the scorching rays of the sun tower above the trail. The white and buff strata give way to sanguine cliffs. At places, the light reflecting from the walls casts an eerie reddish glow through the narrow canyon. An Army officer visiting Supai in the 1800s described the trail: "Before us frowned hideous escarpments and on each hand other walls equally grim and deadly, hemmed us in." The landscape, and the locals, are definitely less threatening now. An occasional cottonwood tree growing in a protected niche hints of hidden water. An uprooted barrel cactus and head-high deposits of debris attest to the power of desert thunderstorms. In 1910, a flash flood rampaged through Supai and filled the canyon wall to wall with 20 feet of water. The village rebuilt downstream, at its present location in a wider section of the canyon. Additional floods in 2008 and then in 2010 further rearranged the landscape. Some areas in the canyon are OFF-LIMITS to visitors due to continuing repair work or unstable ground condition. The creek-side vegetation becomes thicker near the confluence of Hualapai and Havasu Canyons, then thick cottonwoods, willows and scrubby thickets transform the desert into a green ribbon of life. Water appears and disappears in the gravely bed. It trickles then flows vigorously, eventually reaching a rate of 38 million gallons per day. Havasu Creek drains 3,000 square miles of the surrounding desert. Red cliffs reach 1,000 feet into the blue sky and channel the creek down a broad boulevard between the broken escarpments. Two red pillars of stone tower above the village like skyscrapers. The Havasupai call them the Wigleeva, the guardian spirits of the people. According to legend, the canyon will close and destroy the village if the pillars should ever fall. Near Supai, fields of corn glisten in the sun and peaches ripen on trees. Occasional trailside litter detracts from the natural beauty, especially near the village, as does the dried horse manure that powders the trial. The town center consists of a school, a cafe, a convenience store, a small two-story motel and the Havasupai Tourist Enterprise building where hikers register for the campground. Despite its remoteness, Supai resembles many small Arizona communities, except children play and dogs sleep in the "street" without fear of cars. The trail meanders past scattered frame houses with clothes drying on lines and horses tied to door posts and continues another half mile to the first waterfall. Navajo Falls used to tumble 75 feet into a quiet pool here, but the flood of 2008 changed the course of the creek, leaving the old Navajo Falls dry. 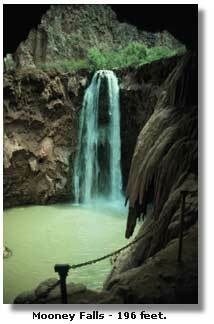 The new Navajo Falls gushes out of thick vegetation about 50 feet into a pool below. A second new falls was created by the same flood, called Lower Navajo Falls or Rock Falls. About 30 feet high and nearly 100 feet wide, it's an impressive and cooling vista, but it's Havasu Falls that's my destination. Not too much farther, the jet-roar of Havasu Falls echoes through the canyon. The stream plunges through a notch in the wall and leaps 100 feet through mist and spray into an aquamarine pool. I've finally reached the destination I've dreamed of for years. I drop my pack and slip into the cooling emerald water. Other hikers frolic in the pool and rest on the travertine dams. For three hours, the summer sun exacted its toll, now the crystal stream repays the debt. Later, I continue through the campgrounds to Mooney Falls. At 196 feet, it exceeds Niagara Falls in height. The trail to the pool leads through two slanting tunnels blasted through the travertine cliff. I grasp a not-so-reassuring chain and descend slippery steps cut in the narrow ledge, remembering that the falls are named after an early explorer who fell to his death trying to reach the base. I spend the rest of the day lolling beside the turquoise stream absorbing the paradoxical beauty of the arid desert and vibrant waterfalls. After another day of exploring the side canyons and mesa tops, I hike back to Hualapai Hilltop, knowing that, with so many other places to see and explore, I may never return. But the emerald waters of Havasu Creek and its famous waterfalls are no longer just a calendar picture for me. They, and the expansive space of this canyon country, are an important part of my personal history. The tribe assesses a $5 per group Environmental Care Fee. 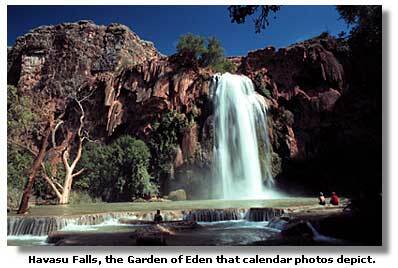 A fee of $35 per person - plus 10% - tax is charged to enter or cross any portion of the Havasupai Indian Reservation. This fee can be paid in advance. Be prepared to show a paid receipt when within the boundaries of the reservation. The campground along Havasu Creek is 10 miles / 16 km from the trailhead at Hualapai Hilltop (2 mi. / 3 km below Supai). It serves up to 250 people. Drinking water is available. Fees: $17/person/night plus 10% tribal tax. The lodge in Supai, 8 miles / 13 km from the trailhead, has 24 rooms with double beds. Rates: $145 for up to four people plus 10% tax. Reservations must be made in advance. Helicopter flights between Hualapai Hilltop and Supai are available Monday, Thursday, Friday, and Sunday, weather permitting. Fees vary, and tickets are issued on a first-come, first-served basis from 10:00 a.m. 1:00 p.m. Tribal members and people with business with the tribe have priority. 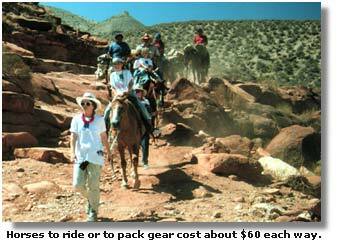 Horses and mules are available from Hualapai Hilltop to Supai and the campground. Prices range from $70 (one-way) to $187 (round trip) plus 10% tax. Breakfast, lunch and dinner are available at the Havasupai Cafe near the lodge. Picnic tables, general store, and post office are found in the village.